Homer may have waxed poetic about “sailing over the dark-wine sea” of the Aegean, but the sea in recent years has become a scene of great human suffering and tragedy. “Gridded Currents,” a group exhibition curated by Kim Hyun-jin which closes Sunday at Kukje Gallery, washes away long-held romantic notions of the sea. In its place is a sea that is highly politicized, a recurring narrative throughout the exhibition. It is a sea that is divided into grids to be conquered, a sea of imperialist ambitions and a sea of underwater cables that carry chatters across oceans. Singapore is an island city state that has expanded its territory through land reclamation projects. In recent years, it has extended that effort into the seabed, opening, on the manmade Jurong Island, underground rock caverns the size of 600 Olympic swimming pools 150 meters below ground level for the storage of liquid hydrocarbon. At the gallery, two works from Singapore artist Charles Lim’s “Sea State 6” (2008) are hung facing each other. 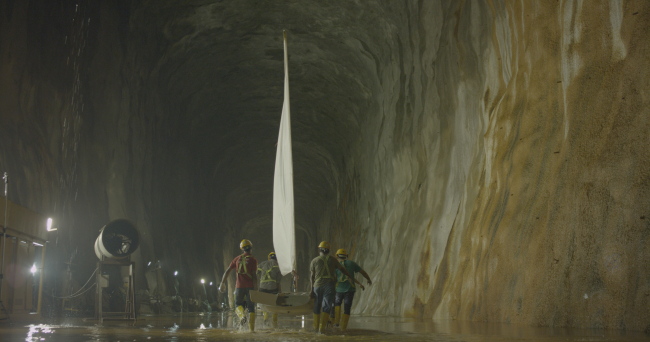 On one side is “Phase 1,” a video documenting the Jurong Rock Caverns, and on the other, “Capsize,” a video that shows the artist attempting to right an overturned dinghy precariously close to what appears to be a cargo ship. In the Singapore government’s relentless efforts to expand its territory through reclamation projects, the sea is now forgotten, claims Lim, whose five works from “Sea State” series are on display at Kukje Gallery. A former Olympic sailor who represented Singapore in the 1996 Olympics, Lim hails from a seaside kampong that has long since disappeared in a reclamation project. "In the ’70s, the sea was very present in everyday lives. I am trying to bring this back through my work,“ he said. Singapore government’s seemingly insatiable appetite for more land has resulted in the disappearance of 25 islands in the Indonesian archipelago, according to Lim, who pointed out that Singapore is the largest importer of sand in the world. Runo Lagomarsino’s works reflect on the history of imperialism, borrowing from old prints to make his point. “Mare Nostrum Mare Mostrum,” meaning “our sea our monster,” is a large curtain featuring a print of an image of a 16th century ship battling a mythic sea monster. Indeed, those who were the first to venture out into the ocean did so much out of greed as out of sense of adventure. Beyond the horizon lay land of gold and a voyage over vast waters must be hazarded to reach the fortune. In Lagomarsino’s borrowing of an illustration from the famous story of the egg of Columbus in “Europe is Impossible to Defend,” the artist attempts to debunk the myth of Christopher Columbus as a discoverer, recalling his legacy as one of displacement of the indigenous people, instead. In the 2015 work “Sea Grammar,” Lagomarsino concerns himself with the very contemporary issue of the humanitarian crisis on the Mediterranean Sea. A loop of 80 slides shows the sea becoming increasingly punctured with holes with only the projector’s light remaining in the last slide. The projection starkly illustrates how the sea has become an impenetrable barrier for migrants hoping to find a better life across the sea. People from all corners of the world communicate seamlessly without giving any thought to what makes it all possible. Swedish artist Nina Canell’s “Shedding Sheaths,” created with plastic sheaths that once covered submarine fiber optic cable bundles, show the physicality of communication. 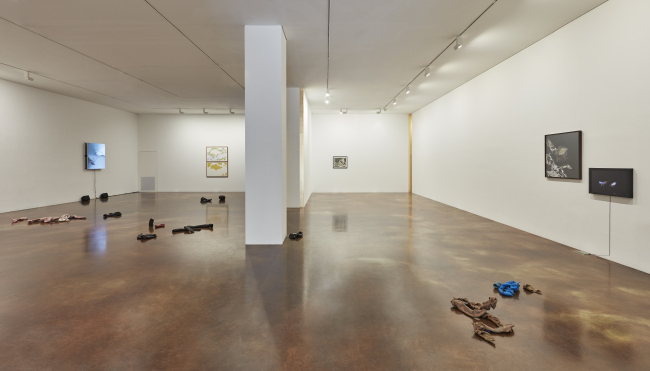 The agonizingly coiled lifeless chunks of plastic sheaths strewn about on the gallery floor are a poignant reminder of the animated conversations those sheaths once carried. At the same time, they conjure up images of the dead bodies floating in the Mediterranean Sea.